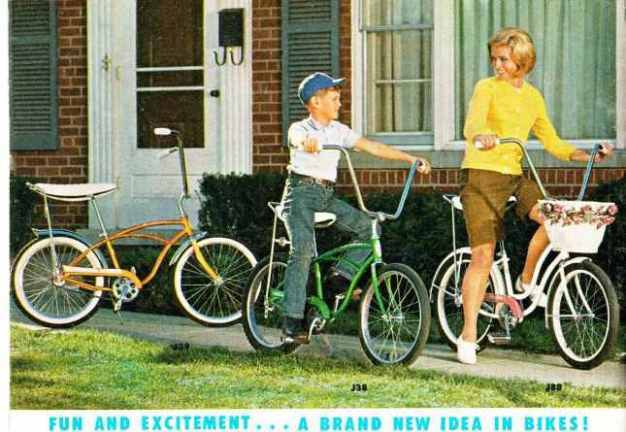 Original text and images of the 1964 Schwinn sales brochure. The text below, including the prices, are as written in 1964. 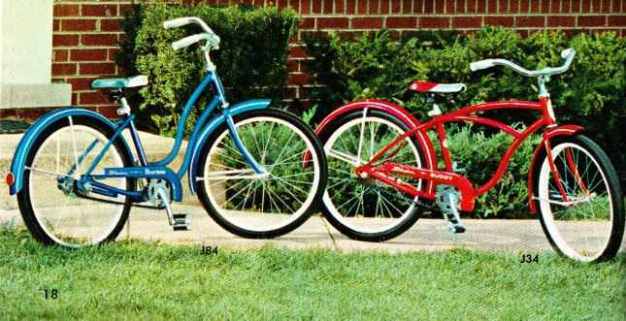 Double your fun on a new Schwinn Tandem. Share the thrill of smooth, easy cycling together with friends or family and you'll discover a new world of riding pleasure on a tandem bike. Heavy duty equipment. Hand brake in front. Coaster brake in rear. Heavy duty Schwinn tubular rims, 26" x 1 3/4" tires. Colors: Flamboyant Red, Radiant Blue or White. 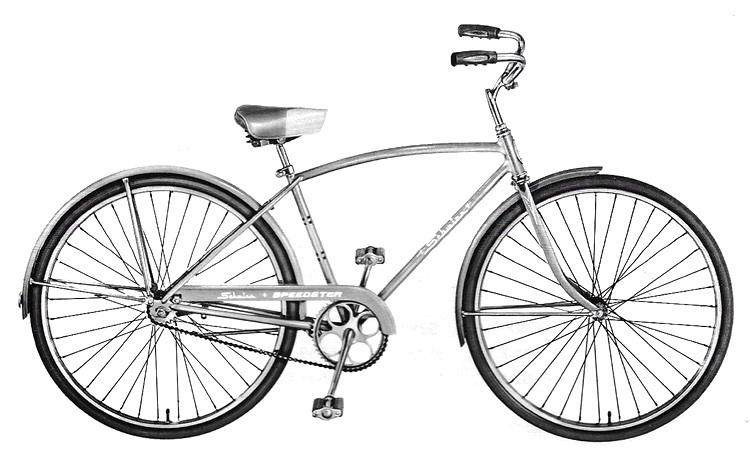 T-10 "Bicycle built for two"
Fenders - Chrome plated... with thicker, more lustrous, longer lasting chrome finish. Hub - Heavy duty front hub... one piece construction, heavy duty axle, handles heavy loads with ease. Rims - Schwinn tubular... double thickness, sturdy, shock absorbent and wear resistant. Tires - 26" x 1 3/4"... nylon, tough, resilient, wear resisting. Chain idler - Adjustable... heavy duty, keeps tension on chain for smoother opertaion. Brakes - Coaster and front caliper, added stopping power. Spokes - 105 gauge... heavy duty, stronger to handle extra weight. 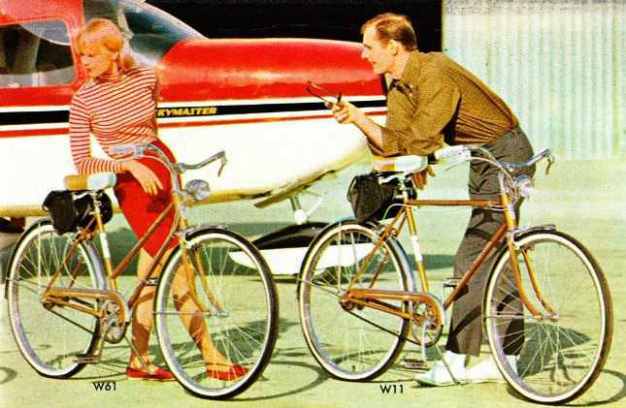 See the complete history of the Schwinn Tandem. New frame design makes mounting and dismounting easy. Extra strong tandem construction throughout. Two brakes for added stopping power. 26" x 1 3/4" tires. Radiant Blue or White. A new concept in tandem design for more family riding enjoyment. Frame - Lower front bar easier mounting and dismounting. Rims - Schwinn tubular, double thickness, sturdy, shock, absorbent and wear resistant. Fenders - Chrome plates, with thicker, more lustrous, longer lasting chrome finish. 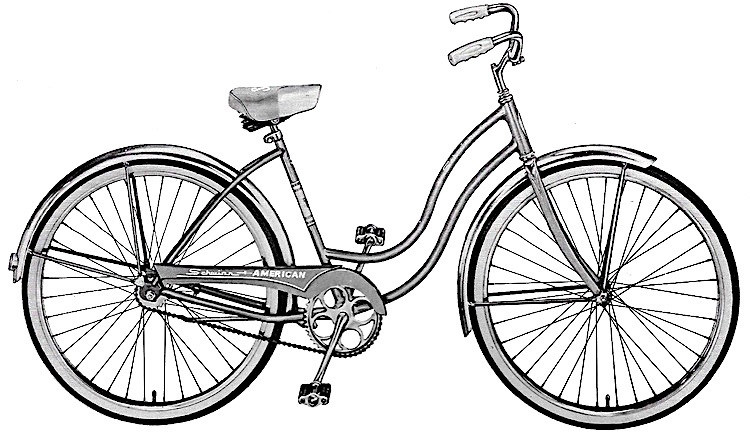 See the complete history of the Schwinn Twinn. 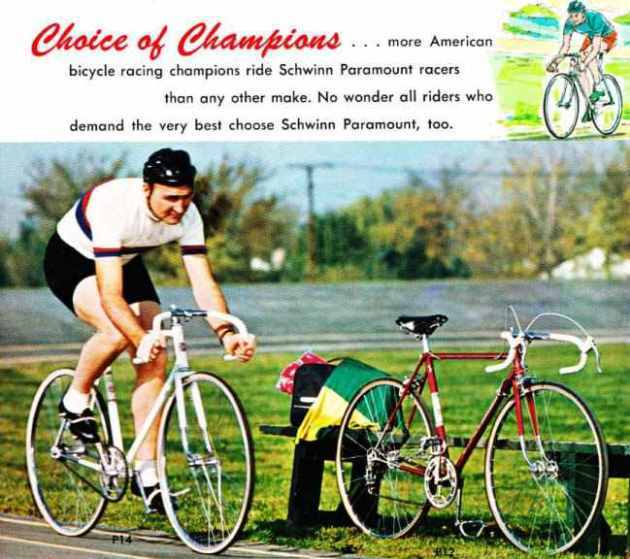 The ultimate in lightweight precision-built bicycles, winners last ten years in U.S. Track Championship races -- truly the "Choice of Champions". Finest materials throughout, hand crafted in four frame sizes, with a wide choice of colors. Made to measure frames at extra cost. Write for specification sheets. 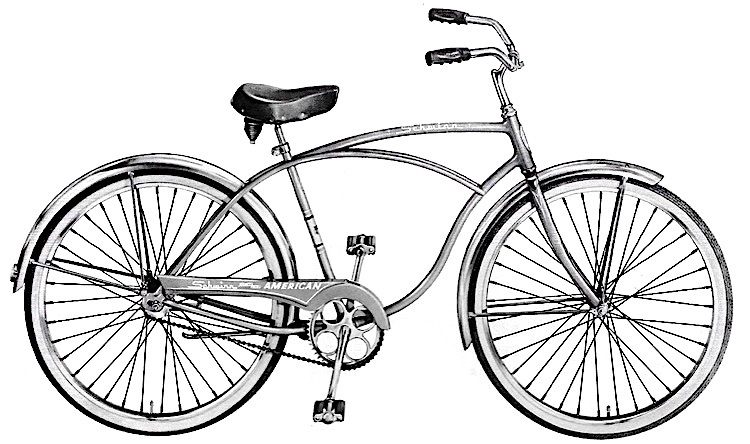 Schwinn quality features for Paramount P-11, P-12, and P-13. Frame - Schwinn diamond type frame... Reynolds 531 double butted toubing...Nervex professional cut lugs... Wide range of frame sizes - 20", 21", 22", 23", 24", 25" - for different size riders... Custom - built made to measure frame available at extra cost. Fork - Reynolds 531 butted oval to round fork blades... Nervex professional crown and Campagnolo Gran-Sport fork tips... light weight, strong and durable. Wheels - Weinmann Aluminum alloy rims on Campagnolo Record high flange hubs with quick release... built to run smoothly mile after mile, year after year. Derailleur - Campagnolo rear ... Campagnolo Record front ... cable operated from bottom bar shifting levers... Regina rear sprocket - 14, 16, 18, 21 and 24 tooth... 55 to 100 gear... allows "fine tunning" to fit the ability of the rider to the demands of road and riding conditions. Equipment - Dunlop 27" x 1 1/4" high pressure road racing tires... Weinmann Vanquer 999 center - pull brakes with quick release ... Brooks mattress saddle... Stronglight Competition 6 3/4" steel cranks... Campagnolo Gran - Sport road head set. Finest quality touring style bike on the market. Top quality road racing and sports bicycle. 10 - Speed road racer Schwinn's finest deluxe equipped sports bike. Frame - Schwinn diamond type frame... Reynolds 531 double butted tubing...Nervex professional cut lugs... tapered 5/8” rear stays head and seat mast angle - 74 degrees. Reynolds 531 round tapered fork blades… forged chrome - moly steel crown and Campagnolo record track fork tips… light weight, strong and durable. Wheels - Weinmann Aluminum alloy rims on Campagnolo Record high flange track hubs, smoother and truer running. Handlebar - Titan steel track bar and stem. Crank set - Campagnolo record alloy 6 1/2” or 6 3/4” cranks with choice of 1/2” or 1” pitch sprockets. 1” 25 x 8 teeth; 1/2” 50 x 16 teeth. Equipment - Lyotard platform pedals with Christophe toe clips and Lapize straps… Campagnolo Gran - Sport head set… Brooks competition saddle, tubular sew - up track tires… Reynolds aluminum alloy seat post. Drop Bars, or racing handlebars as they are often called, make an astonishing difference in riding efficiency, adding power, speed and endurance most people never knew they possessed. It is this thrilling experience, a new discovery for most of us, that has led to the great popularity of sports bikes and much of the public's renewed interest in cycling for excercise and recreation. More power! Drop bars allow the rider to lean forward at about a 45 degree angle when his hands are on the upper part of the handlebar and a little lower when his hands are on the "drops" or lower bar. This "crouch" position cuts down wind resistance and increases the rider's leverage on the pedals so he can go faster and farther with about half the effort required in the upright or erect position. Doctors say the leaning forward position lessens weight on the spine, expands the chest and lungs and stregthens muscles in the arms and shoulders. Try it -- it's good for you! Good quality road bike with 15 speed derailleur, 36 to 100 gear, quick release center pull brakes, large flange quick release hubs, aluminum alloy rims, 27" x 1 1/4" high pressure road tires. Mudguards available at extra cost. Colors: Flamboyant Lime, Radiant Coppertone, Sky Blue or Terra Cotta. Derailleur - sprint derailleur, 15 speeds extra wide 36 to 100 gear, allows "fine tuning" to fit the ability to the rider to the demands of road and riding conditions. 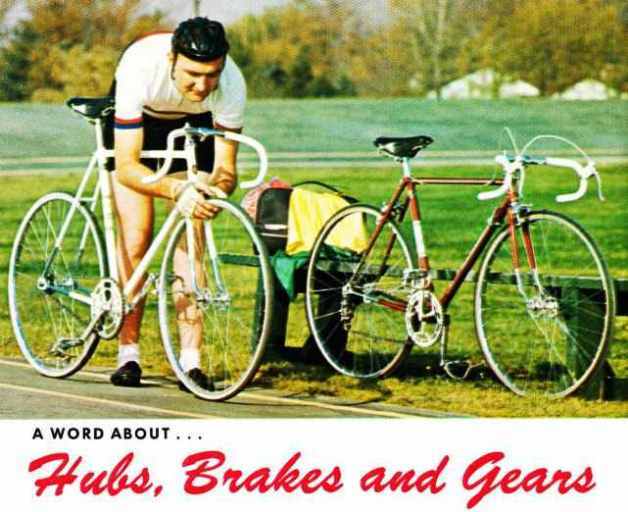 Hubs - alloy hubs, quick release, allows for easy removal of wheels so bike can be stored in car trunks - quickly reassembled and fast tire changes. Brakes - center-pull, quick release, hooded brake levers and sure stopping power. Fork - tubular chrome, sturdy and durable. Rims - Schwinn tubular S-6 rims, shock absorbent and wear - resistant. Equipment - Top quality 27" x 1 1/4" high pressure road tires, Maes style drop handlebar with steel stem, lycett leather racing type saddle and large spoke protector. 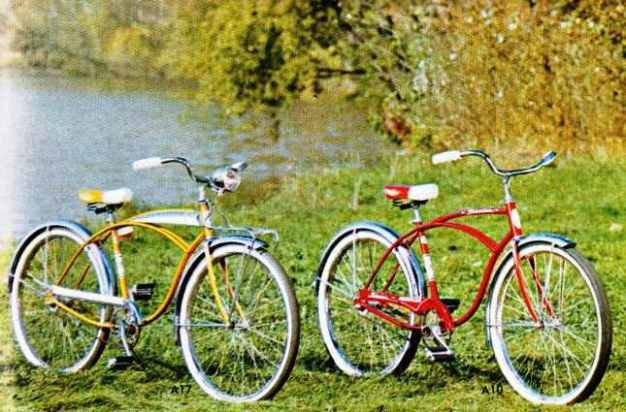 See the complete history of the Schwinn Sierra. Good quality road bike with high speed racing wheels. Schwinn diamond type frame, Sprint derailleur, 38 to 96 gear, quick release hubs, quick release center pull brakes, chrome tubular front fork, Schwinn tubular rims 27" x 1 1/4" high pressure road tires. Mudguards available at extra cost. Derailleur - sprint derailleur, 10 speeds, wide range 38 to 96 gear, allows "fine tuning" to fit the ability of the rider to the demands of road and riding conditions. Hubs - alloy hubs, quick release, allows for easy removal of theels so bike can be stored in car trunks - quickly reassembked and fast tire changes. Brakes - center pull, quick release, hooded brake levers and sure stopping power. Rims - Schwinn tubular S-6 rims, shock absorbent and wear resistant. Fork - lightweight, chrome tubular steel, sturdy and durable. Equipment - Top quality 27" x 1 1/4" high pressure road tires, welded on brake and derailleur fittings, Maes style drop handlebar with aluminum alloy stem. Lycett leather racing style saddle and large spoke protector. 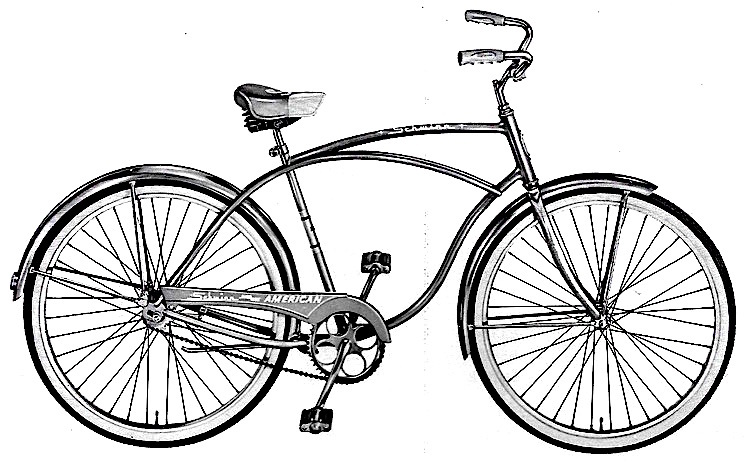 See the complete history of the Schwinn Continental. An outstanding value in a 10 speed derailleur bicycle. Schwinn does it again. 38 to 96 gear (33 to 85 gear on a model 224), 27" x 1 1/4" sports touring tires, and Schwinn tubular rims (24" on model 224). 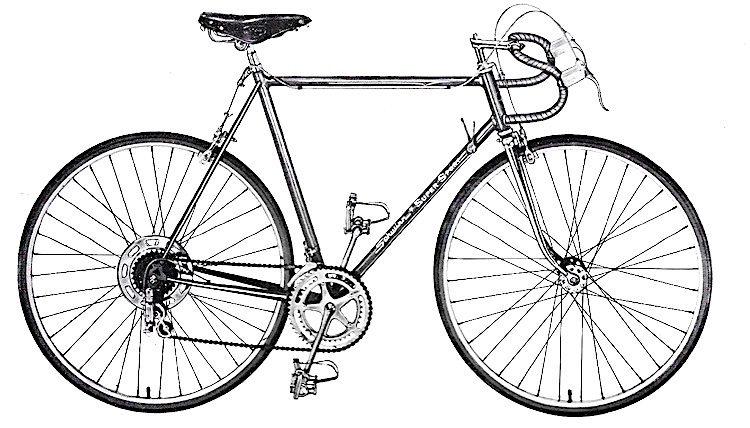 Racing style handlebars and saddle, and large flange Sprint hubs. Mudguards available at extra cost. Derailleur - sprint derailleur, 10 speeds, wide range 38 to 96 gear, allows “fine tuning” to fit the ability of the rider to the demands of road and riding conditions. 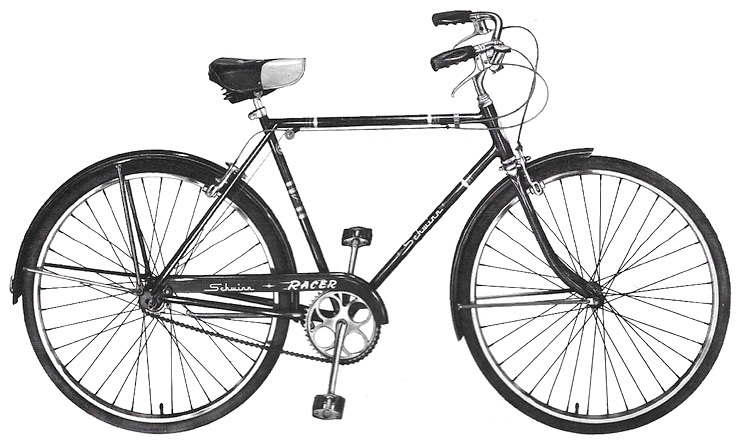 Frame - Schwinn diamond type frame, made with special head, hanger and fork-end design. Special welding aligning processes, strong, true running and long lasting. Handlebar Stem - light weight steel, sturdy and built to last. Rims - Schwinn tubular S-6, shock absorbent and wear resistant. Brakes - caliper brakes, quick release hooded brake levers and surer stopping power. Equipment - Top quality 27" x 1 1/4" nylon sports touring tires, welded on brake and derailleur fittings, large spoke protector, Sprint racing saddle, rat trap pedals and forged steel fork. Everything the sports rider wants in a top quality road bike. Light, strong hand brazed frame of chrome molybdenum steel alloy, 10 speed Sprint derailleur, 38 to 96 gear, 27" x 1 1/4" road tires. Colors: Radiant Coppertone, Sky Blue or Terra Cotta or Violet. 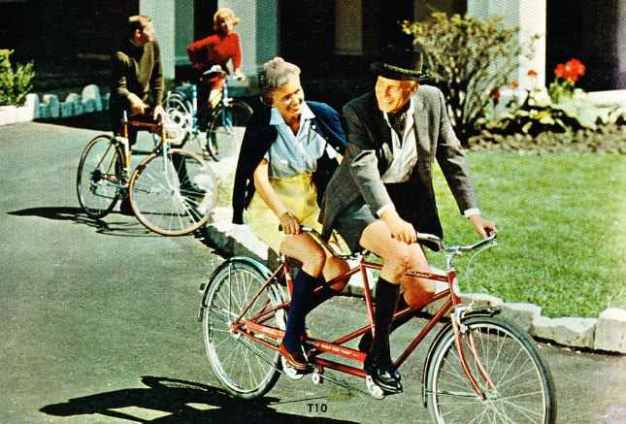 Here's a bike that takes the drudgery out of pedaling, with easy to operate 10 speed, 38 to 96 gear, comfortable mattress saddle, tourist handlebars, chrome fenders. Schwinn tubular rims, 27" x 1 1/4" tires. Colors: Flamboyant Lime, Radiant Coppertone or Sky Blue. 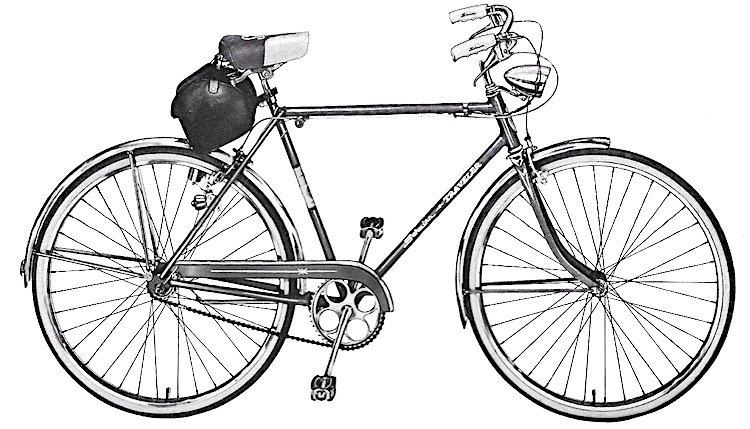 Easy riding 10 speed model with Sprint derailleur, 38 to 96 gear, tourist handlebars and saddle, chrome plated fenders. Specially designed lightweight with lower saddle position for younger riders, forged steel fork, Schwinn tubular rims, 1 3/8" wide nylon tires ( 1 1/4" tires on R30), choice of 3 speed, 2 speed or coaster. Colors: Flamboyant Red, Radiant Blue or Black. No Black on 20 inch model. 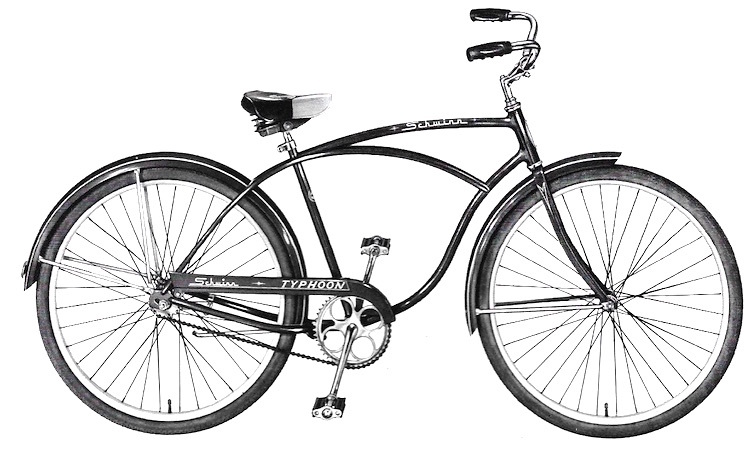 See the complete history of the Schwinn Speedster. New budget priced derailleur model with 5 speeds, 45 to 85 gear, Schwinn tubular rims, 26" x 1 3/8" nylon tires, tourist style handlebars and saddle. Colors: Flamboyant Red, Radiant Blue, Coppertone or Black. Also available in a Ladies model, C61, with the same color options. Ladies’ deluxe equipped lightweight tourist model. Beautiful fully equipped bike with stainless steel fenders, generator set, light, saddlebag, cushioned saddle, and nylon whitewall tires. Colors: Flamboyant Red, Radiant Blue, Coppertone or Black. Lightweight styling with a galaxy of special features. Stainless steel fenders, generator, light and saddlebag. Choice of coaster, 2 or 3 speed with 26" wheels. 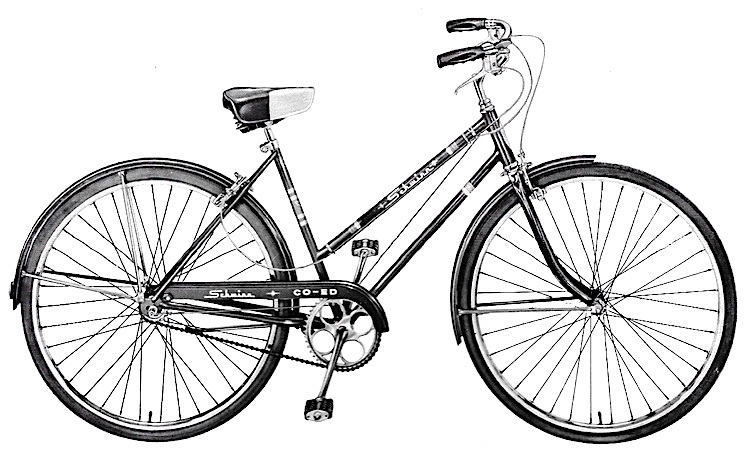 The best known, best selling Schwinn lightweight. 26" wheel size in three frame sizes. Colors: Flamboyant Red, Radiant Blue, or Black. 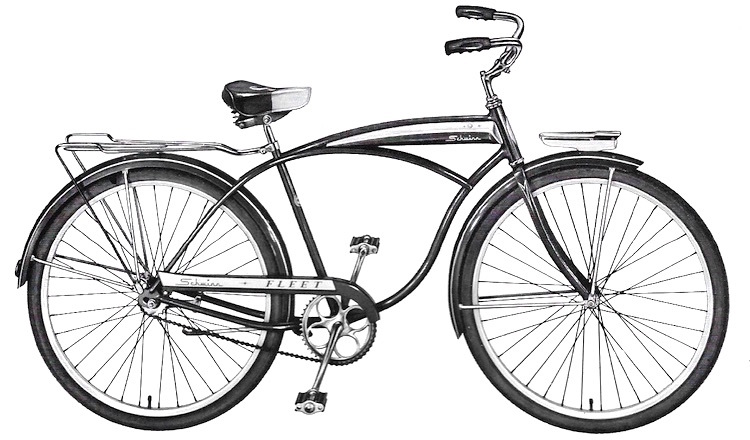 See the complete history of the Schwinn Racer. Economy priced Schwinn lightweight. Easy to balance, easy to ride. Schwinn quality too. Colors: Flamboyant Red, Radiant Blue, Black or White on 26". No White or Black on 24" model. 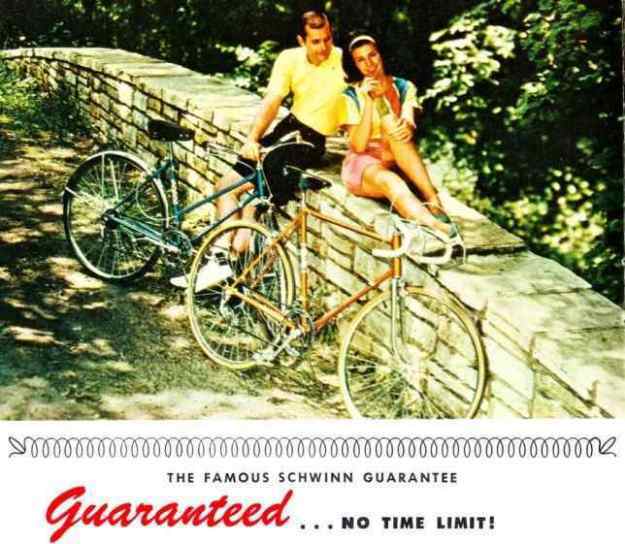 Schwinn bicycles are guaranteed against all defects in material and workmanship --- no time limit. Schwinn will replace - without charge - any original part that is returned to the factory and found to be defective under the terms of this guarantee. Failure due to accident, abuse, neglect, normal wear or use of other than Genuine Schwinn Repair Parts is not covered. Transportation costs and dealer's labor charges are not covered by this guarantee. Double thickness rims produced on Schwinn's special rim mill -- stronger by far than ordinary rims. Smoother, harder, easier rolling. Scientifically heat-treated to last longer. 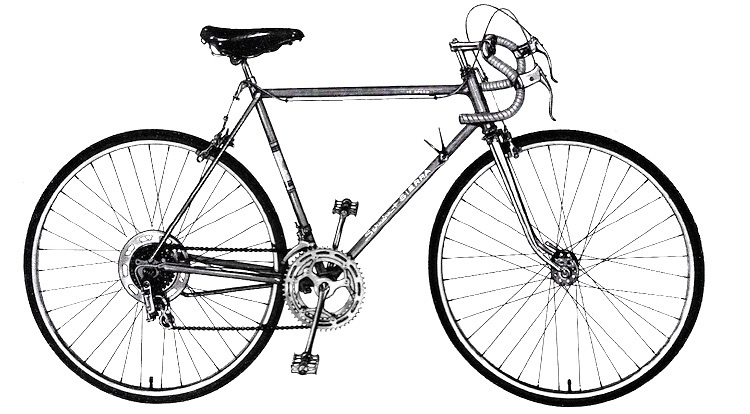 No other bicycle frame is made like a Schwinn, with special head, hanger and fork end design and special welding and aligning processes that make Schwinn bicycles the strongest, truest running and longest lasting ever built. Stronger, rattle-proof and trouble-free for lasting satisfaction. Heavy duty construction for greater strength and better support. The finest, must lustrous and longest lasting baked-on colors that stay on. you pay, no matter what model you choose, Schwinn gives you more for your money... because Schwinn bikes, the quality bikes, are best! 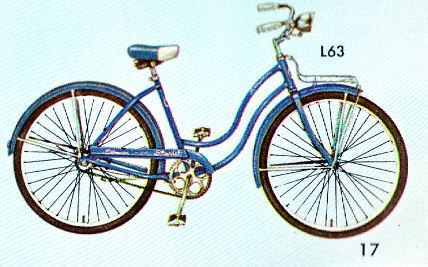 Sold and Serviced by factory trained Schwinn Dealers. Famous doctors agree cycling for all ages is one of the best ways to achieve and maintain physical fitness. "I'd like to put everyone on bicycles... not once in awhile, but regularly as a routine. That's a good way to prevent heart disease." "On a bicycle, the weight of the upper portion of the body is supported by the arms, relieving the weight of the chest, and lung capacity develops." "The bicycle loosens up the muscles of the legs, the thighs, the loins, and the abdomen." "The physical well being which it affords you by relaxing your nerves restores your spirit by giving it back its calm and equilibrium." 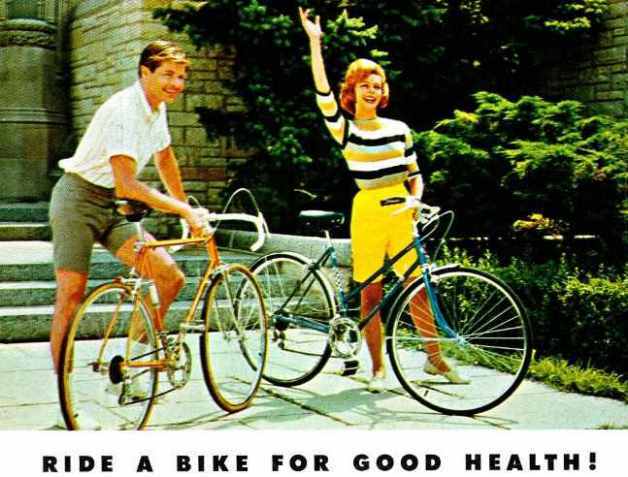 Schwinn's 1964 models, like the new cars, offer many improvements over earlier years - not in engineering and performance alone, but also in the wider variety of models and fine equipment to suit every need. Much of the fun of cycling comes from selecting the rightbike - not just from riding any bike. If you are an adult or teenager, it's no fun to ride a bike that is too small, or a heavy-pedaling delivery type bike when you want recreation. You'll get better exercise and more real enjoyment from a 10 speed bike. Your Schwinn dealer will be glad to help you select the model that's best suited to the kind of riding you want to do and best fitted to your stature and physical ability. 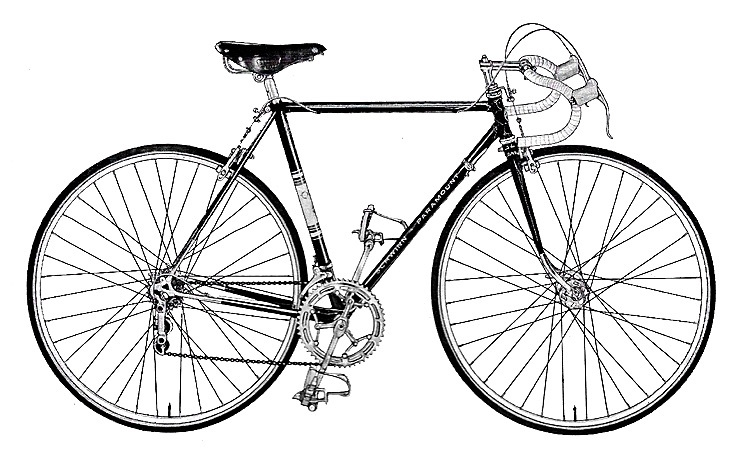 In the preceding pages, have narrow tires and triangular "diamond" frames. 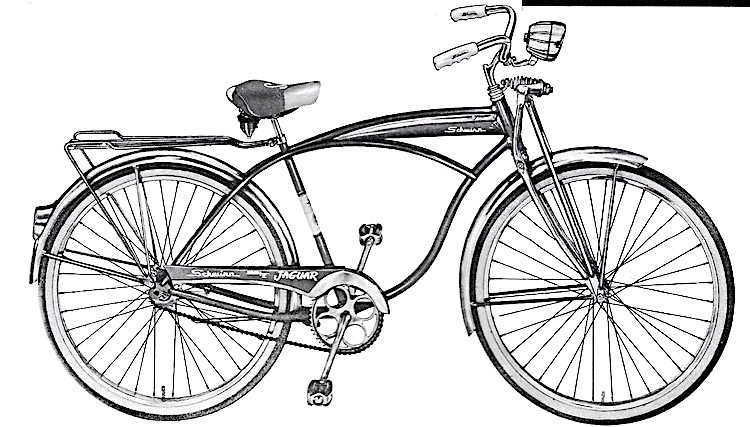 Sometimes called "English" or "racer" bikes, they are better described as adult bicycles, a type which has been built by Schwinn since 1895. 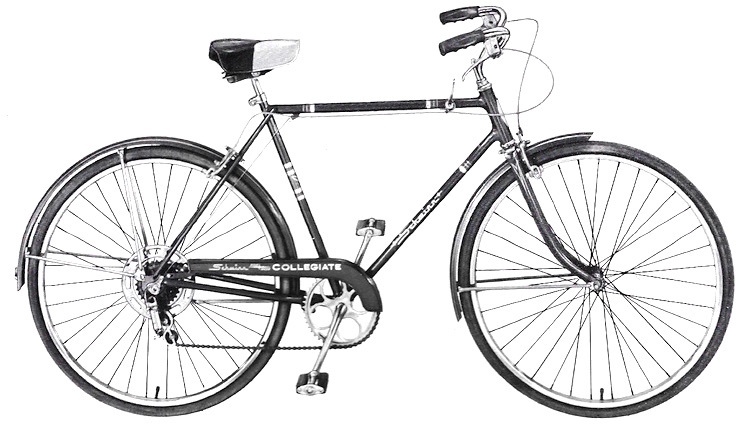 Our 1964 lightweights are faster and lighter to pedal because of their high pressure tires, light wheels and gearing. These bikes are strong and dependable but require sensible use and reasonable care to avoid damage by abuse. In the following pages, have curved bar frames, heavier wheels, wider and softer tires which require a little more pedaling effort. They are not as comfortable for most adults because of the lower riding position. They are built for durability rather than maneuverability and are offered in a wide range of children's styles and utility models. 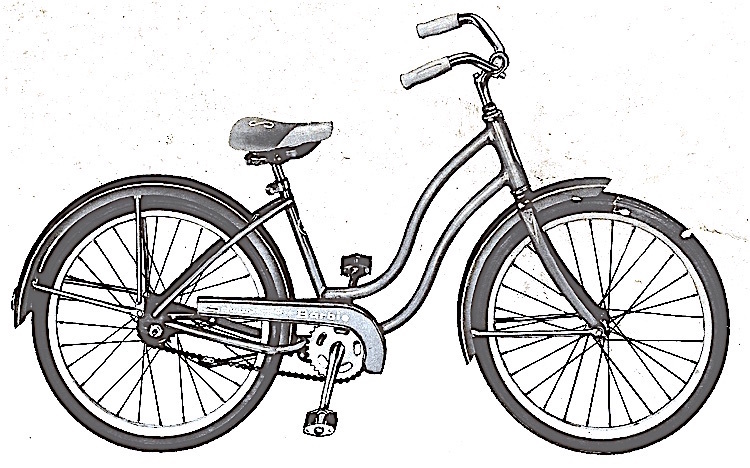 Many Schwinn models offer a choice of coaster brake, or 2 speed or 3 speed hub at extra cost. A brief description of this equipment is given below. 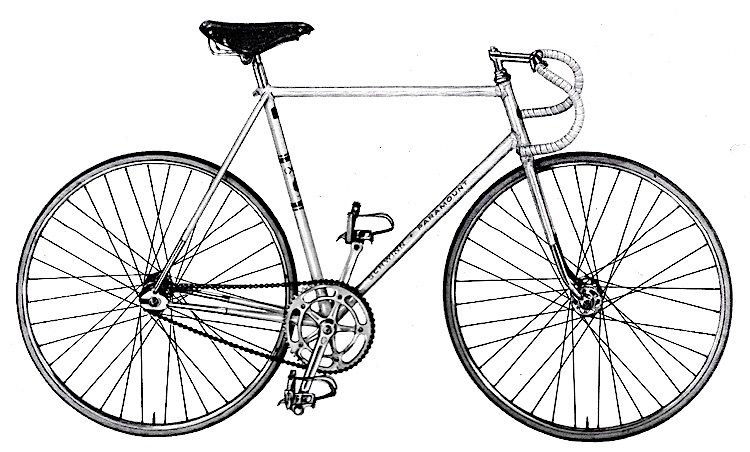 Most bicycles are equipped with conventional coaster brakes which allow the bike to coast when the rider stops pedaling. The brake is inside the rear coaster hub and is applied by pushing back on the pedals. Similiar to regular coaster brake but has a built in lower gear for quicker starts or for climbing hills. 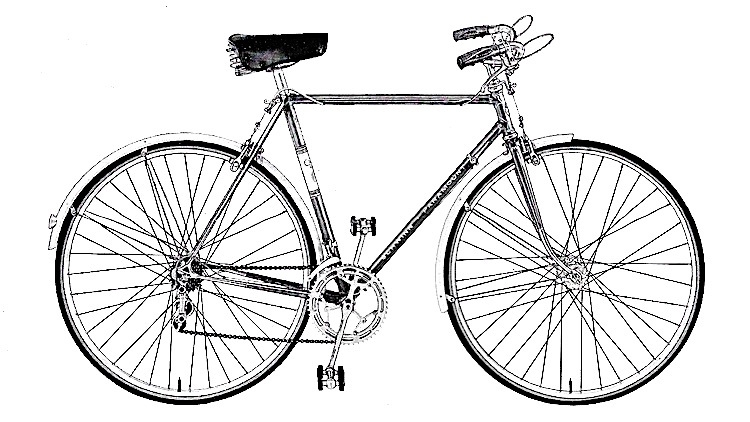 Shifts from one gear to the other by back pedaling slightly, but not enough to apply the coaster brake which is operated by pushing back all the way on the pedals. 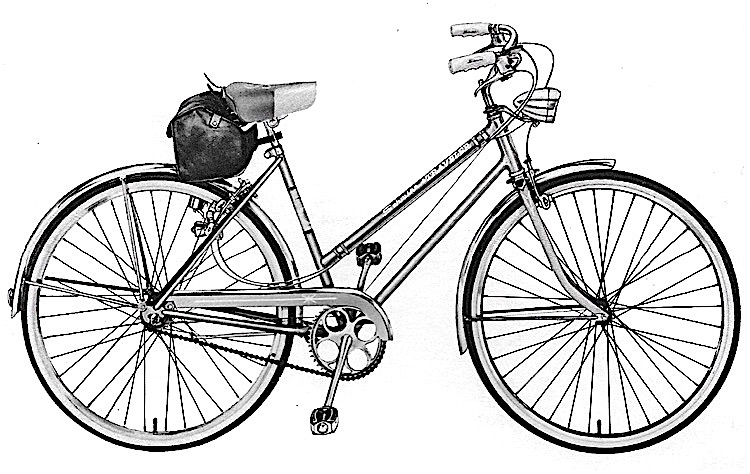 A rear hub with built-in low gear, normal gear and high gear. 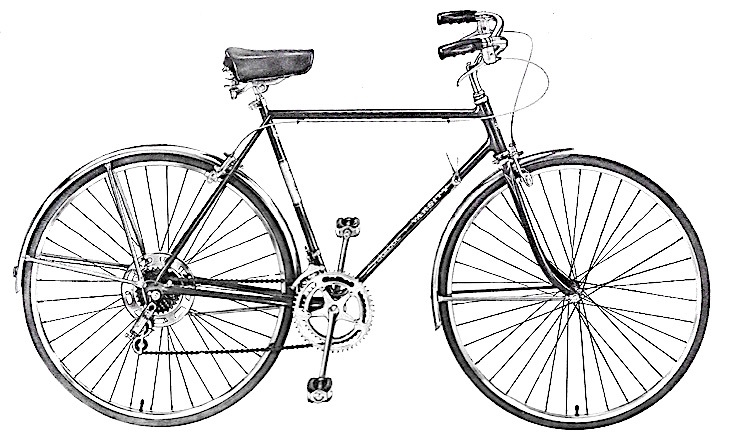 Gears are shifted by a lever on the handlebar. Two types of 3 speed hubs are available. 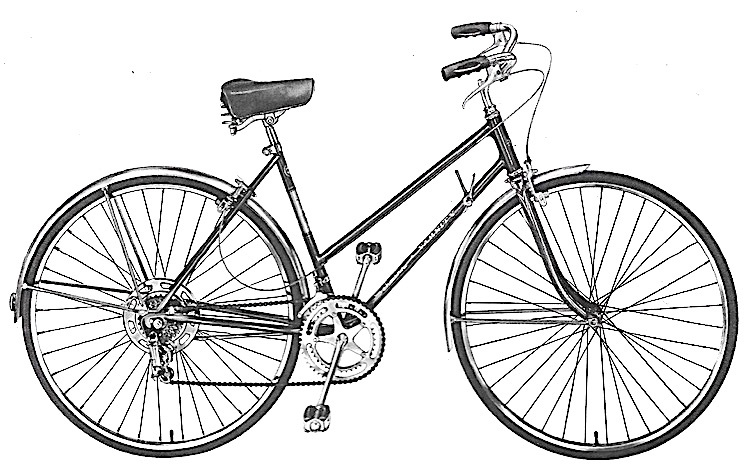 The regular 3 speed has no coaster brake, so front and rear brakes are used. 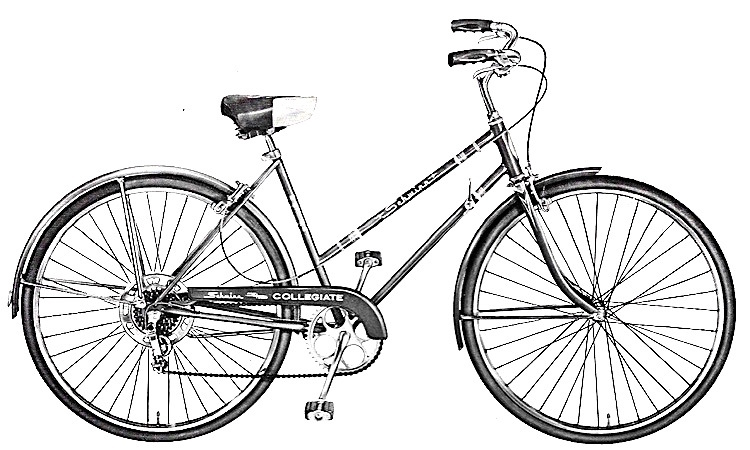 The TCW 3 speed has a built-in coaster brake, but a front brake is also used with the TCW on Schwinn models. TCW hubs are optional at extra cost on 3 speed models. Schwinn derailleur bikes have five cogs, or sprockets, of different sizes on the rear hub and, one, two or three front sprockets (depending on the model). 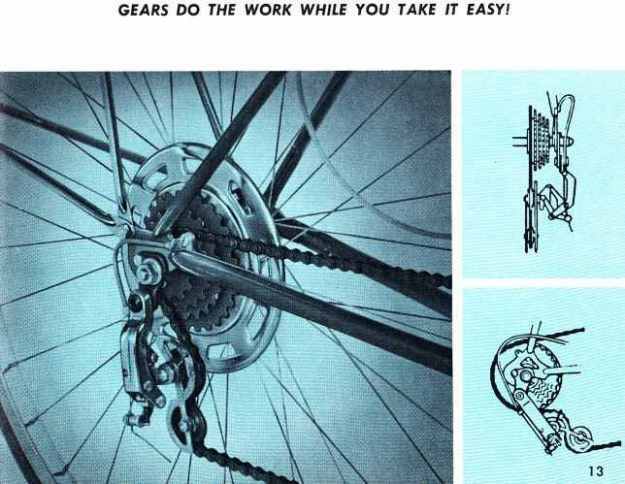 The chain can be "derailed" from one sprocket to another by means of a shifting mechanism, thus changing gears. 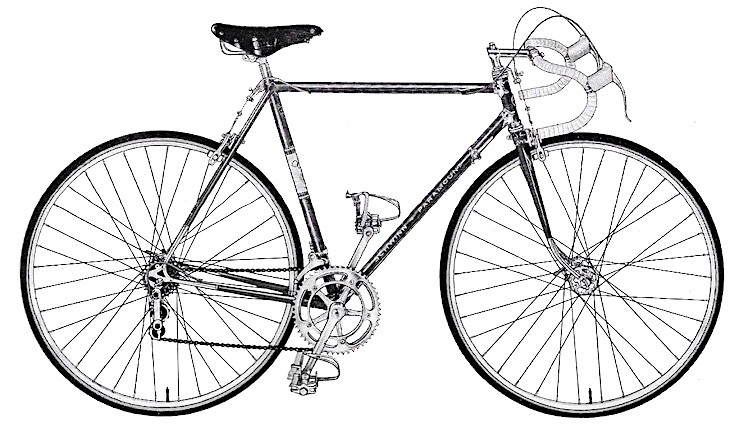 A 5 speed model has five rear cogs and one front sprocket, a 10 speed has five rear cogs and two front sprockets, and a 15 speed has five rear cogs and three front sprockets. Hand brakes are used on all derailleur models. Awaits you if you haven't already tried a bike with derailleur gears. It's the most fun anyone can experience on a bike! Fast, yes... But that's not all! While it is true that bike racers may reach speeds over forty miles per hour on derailleur bikes, most people ride derailleurs for another reason - to save work and add more pep to their cycling. Why strain muscles when it is easy to let the gears do the work, especially on hills and against the wind? That's the real fun of riding gears that go! Not just to increase speed, but to allow "fine tuning" to fit the ability of the rider to demands of the road and riding conditions. With a full range of gear ratios at his command the rider can avoid unnecessary work, conserve his energy and cover more miles in less time and with less fatigue. Something special - from the front wheel to the rear. Shock absorbing front fork, Schwinn headlight, tank, horn, two tone saddle, carrier, and stainless steel fenders. Colors: Radiant Coppertone and Black. 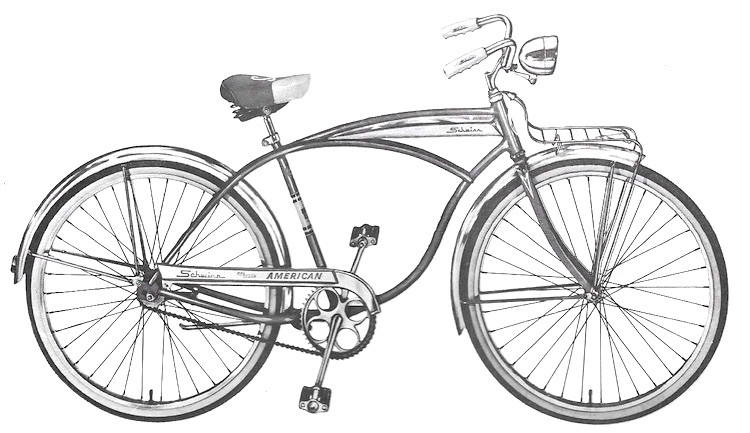 See the complete history of the Schwinn Jaguar. The bike design that sets the pace. Clean, crisp and loaded with extras. 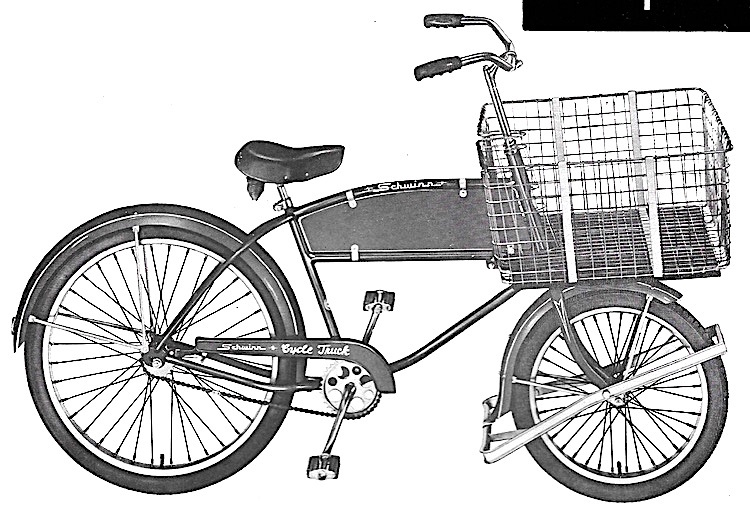 Double hinged carrier, stainless steel fenders, whitewall tires and Schwinn light. Colors: Flamboyant Red, Radiant Blue, Coppertone and Black. 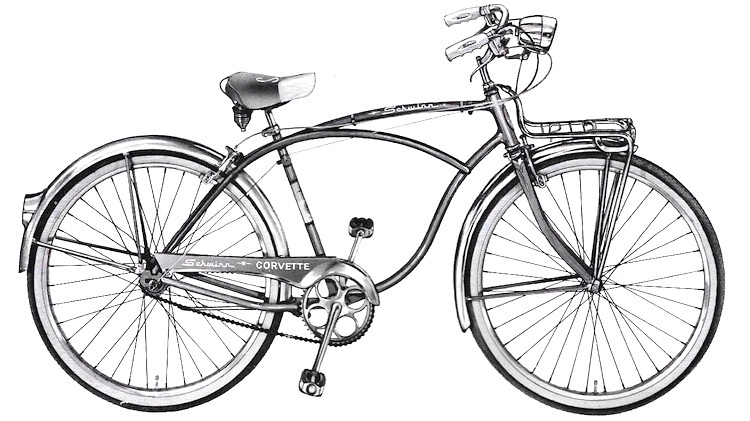 See the complete history of the Schwinn Corvette. An outstanding value in cantilever design. Whitewall tires, chrome plated fenders, front carrier, Schwinn headlight, two tone saddle and forged steel fork. 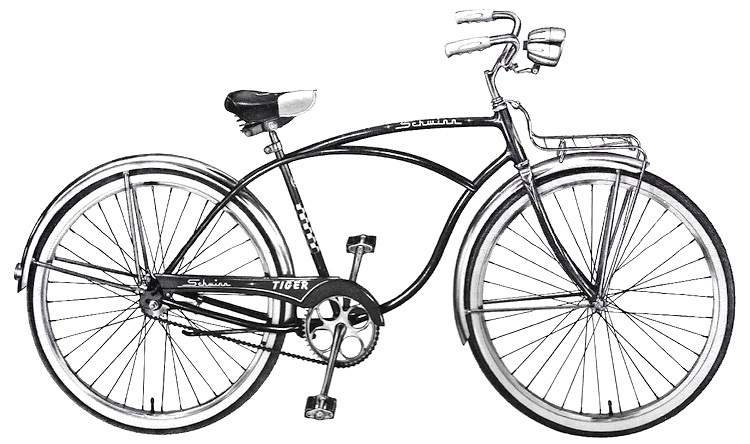 See the complete history of the Schwinn Tiger. Fully equipped, economy priced, and availble in all sizes. Apopular bike for those who appreciate extra value. Colors: Flamboyant Red or Black. No carrier on 20" size. 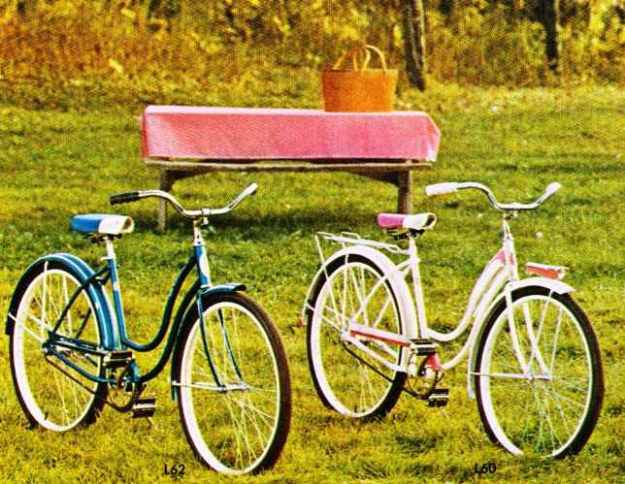 See the complete history of the Schwinn Fleet. 100% American made and fully equipped. Lavish chrome trim. Light, tank, horn, chrome fenders, whitewall tires. Colors: Flamboyant Red, Radiant Blue or Coppertone. 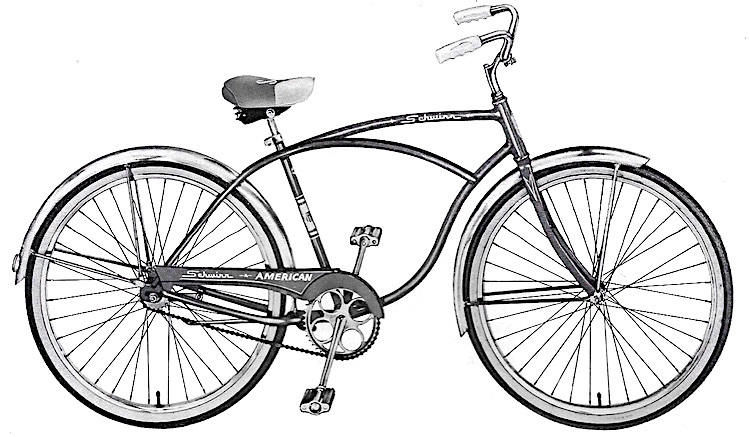 See the complete history of the Schwinn American. The all- American fully equipped middleweight. 100% American made. Offered in regular or King size with extra large cantilever frame... heavy duty model too. Colors: Flamboyant Red, Radiant Blue, Coppertone or Black. No Coppertone on 24" model. Kingsize model in Flamboyant Red or Black only. Largest middleweight frame size for tall teen - agers and adults. Genuine Schwinn craftsmanship at a popular low price. Schwinn tubular rims and 4-coat baked finish. Colors: Flamboyant Red or Black. 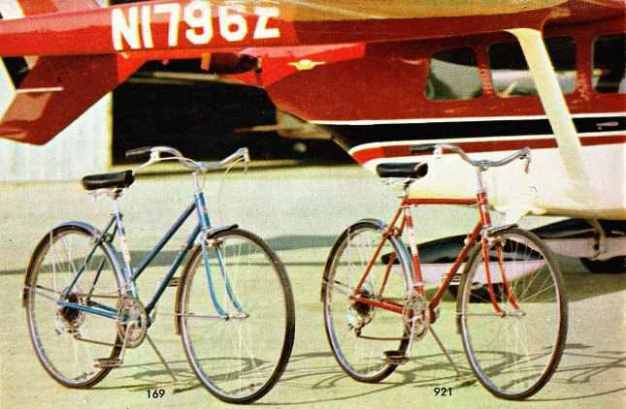 See the complete history of the Schwinn Typhoon. Low priced standard middleweight model. Cantilever frame, built in kickstand, front carrier, light, two tone saddle, nylon tires. 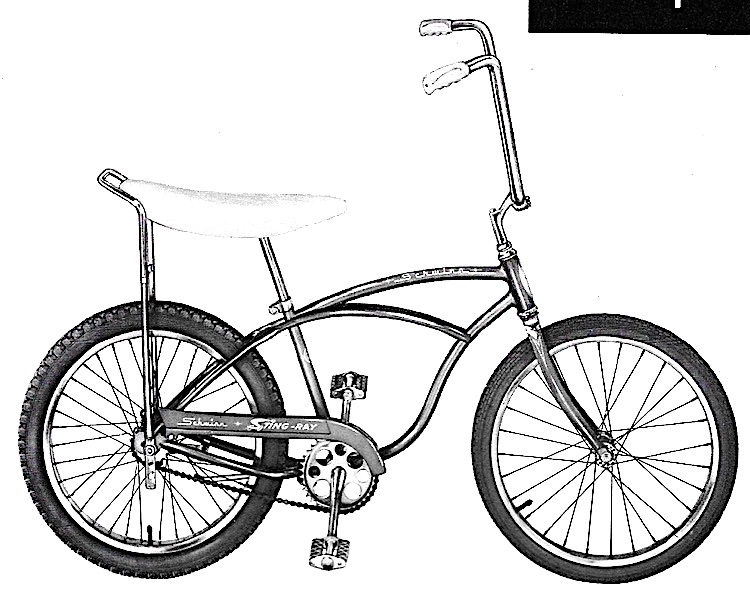 See the complete history of the Schwinn Hornet. 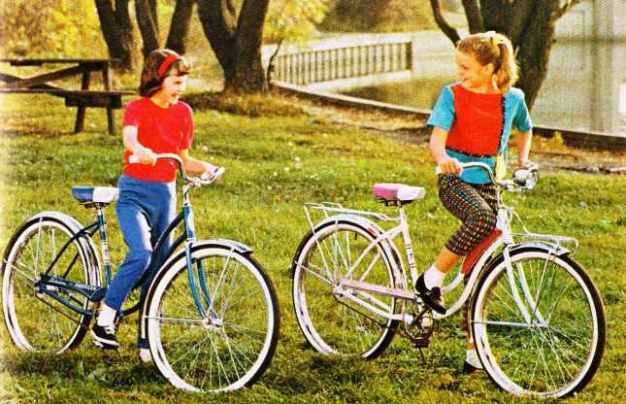 For the girl who wants Schwinn quality at a budget price. A sturdy, beautifully styled bike for day in, day out riding ... designed for compliments too. Colors: Radiant Blue or White with Rose. See the complete history of the Schwinn Hollywood. Fully equipped and economy priced. Smooth riding, smooth looking, and fully equipped at an economy price. Just look at these features! Chrome trimmed headlight, two tone enamel finish, two tone cushioned saddle, long wearing nylon cord tires, and chrome carrier on 26" and 24" models. 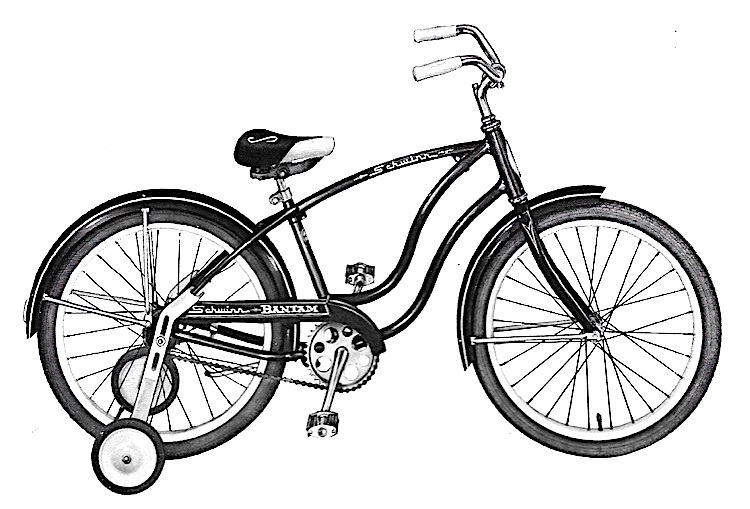 See the complete history of the Schwinn Fiesta. A practical and perfect bike for day to day riding to school, to visit friends, or just for pleasure. Genuine Schwinn quality. Chrome fenders, two tone saddle, built in kick stand, nylon cord tires. Colors: Flamboyant Red, Radiant Blue or White with Rose. Beutiful fully equipped American made model. American made for American girls. 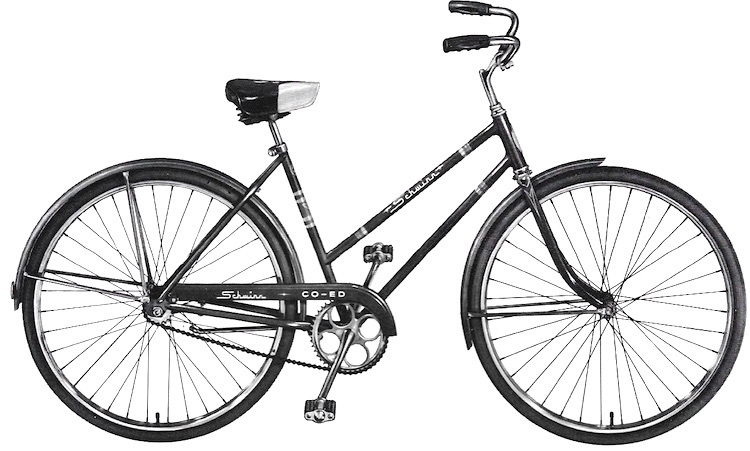 The Schwinn deluxe American is styled for feminine tastes and riding ease. Quality equipped with chrome fenders, chrome rims, chrome headlight, chrome trimmed tank with a built in horn, two-tone saddle, chrome carrier, and chrome trimmed chainguard. Colors: Radiant Blue or White with Rose. Rear carrier optional at extra cost. Semi - equipped girl’s model. 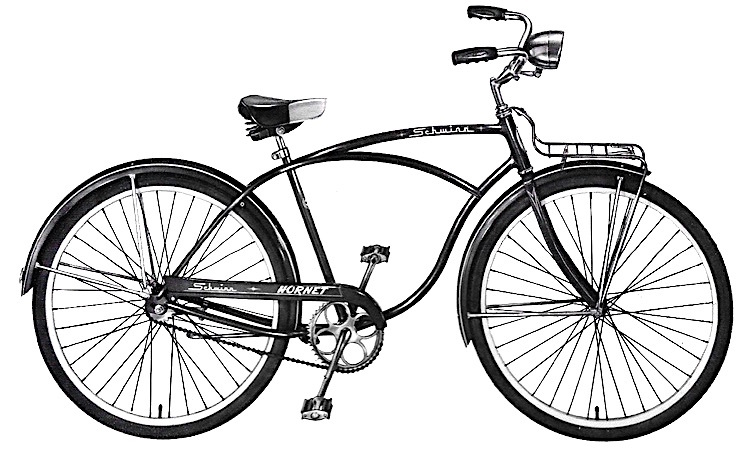 Gracefully designed, with front carrier, headlight, built in kickstand, two tone saddle, sleek chainguard. A sturdy bike that rides and balances with ease. 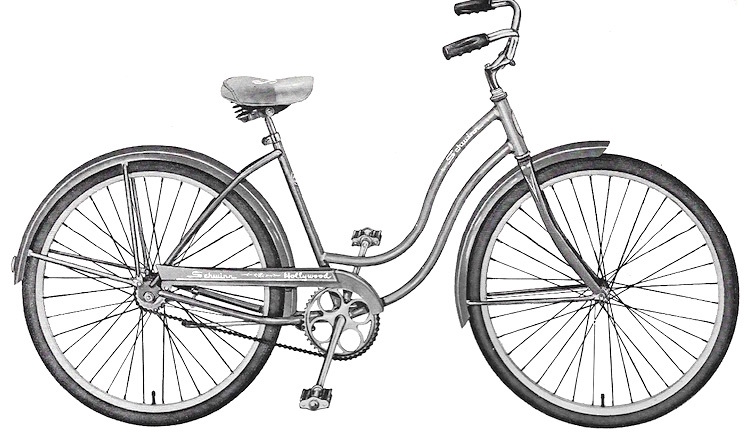 See the complete history of the Schwinn Starlet. Perfect for boys or girls 5 to 7. Convertible 20 inch model for boys and girls 5 to 7. Complete with training wheels. Fully pnumatic tires, coaster brake. 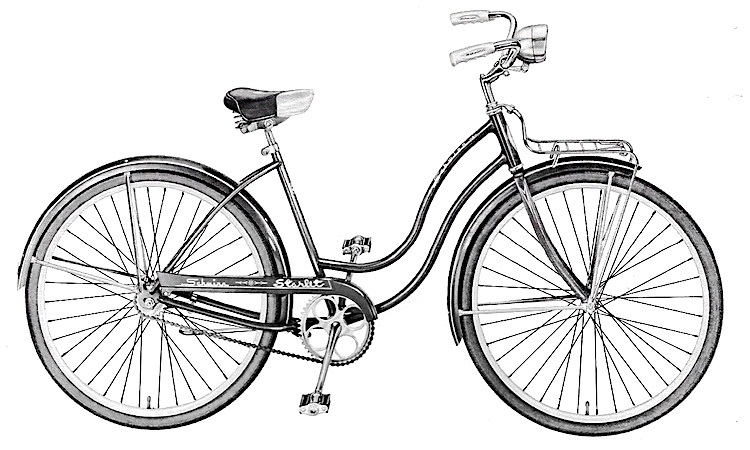 See the complete history of the Schwinn Bantam. Convertible 16” bike ideal for beginning riders. Built to last. The ideal "first" bike for tots 3 to 5. Complete with training wheels. Coaster brake. Chrome fenders. Colors: Flamboyant Red or White with Rose. 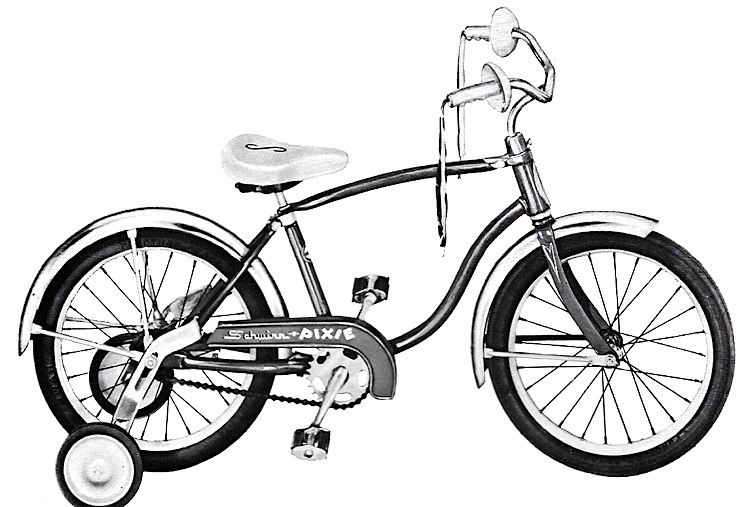 See the complete history of the Schwinn Pixie. Girl’s 20 inch economy priced coaster brake mode. The perfect 20" coaster brake model for beginning riders 5 to 7. 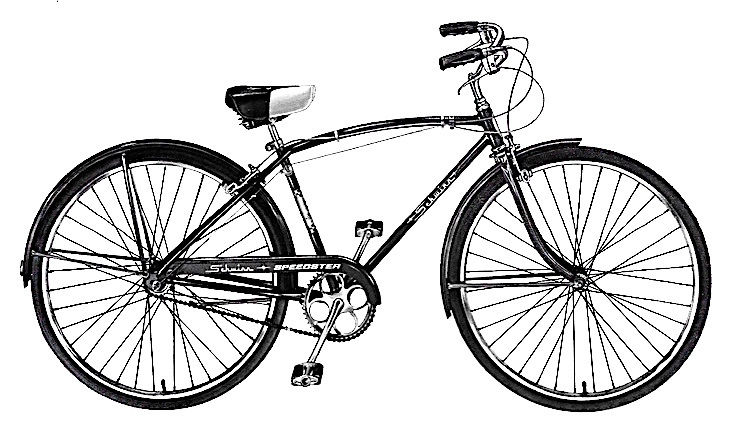 Equipped with Schwinn designed wheels and tires ... quality features found on top models. 20 inch economy priced coaster brake model. 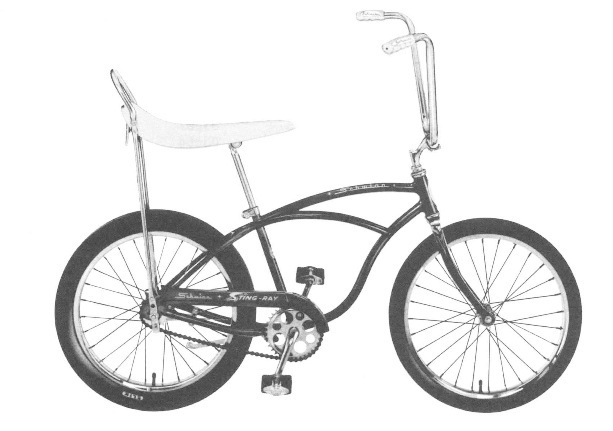 The ideal 20 inch economy priced coaster brake model for boys 5 to 7. Electro Forged cantilever frame. Forged steel fork, one piece crank. 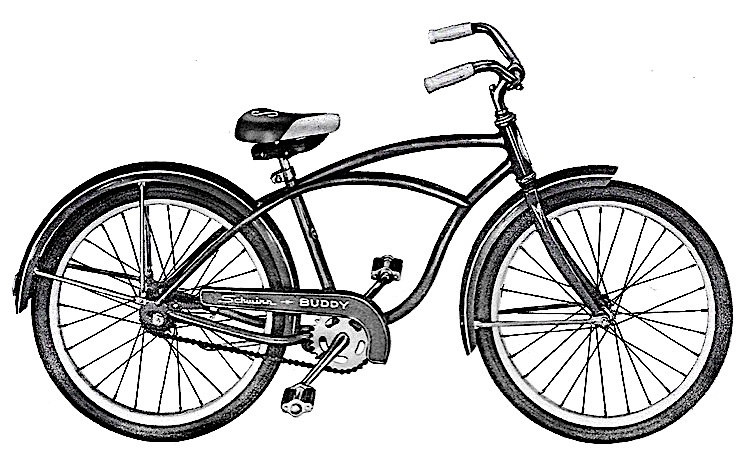 See the complete history of the Schwinn Buddy. The "newsboy special". Extra sturdy balloon tired bike for messenger work, or delivery service. Also available in a heavy duty model with a heavy duty front hub, 120 gauge spokes. 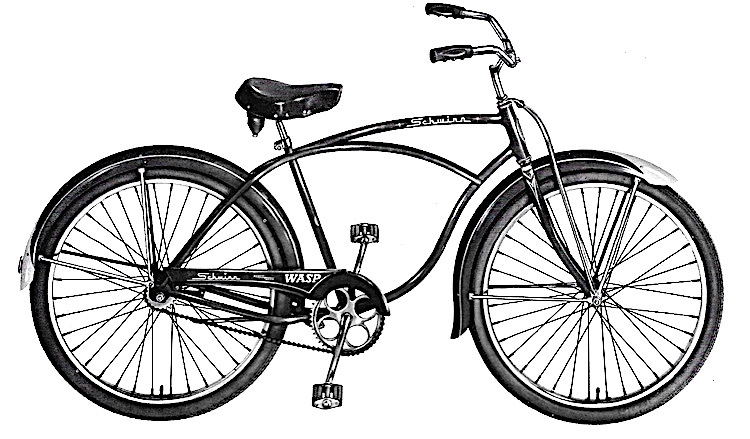 See the complete history of the Schwinn Wasp. Heavy duty frame, special heavy duty wheels, balloon tires, 20" front and 26" rear. Heavy 120 gauge spokes. Metal sign for identification. Large basket, 28" x 22" x 11". Small basket, 24" x 16" x 11". 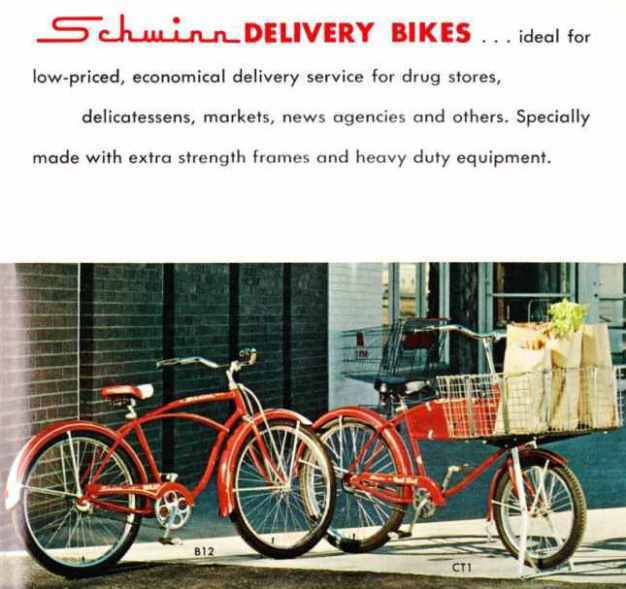 See the complete history of the Schwinn Cycle-Truck. 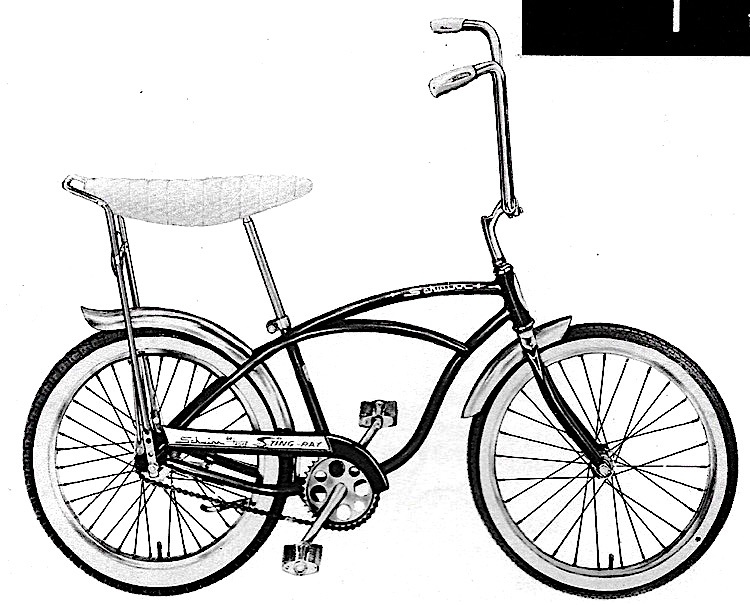 Schwinn’s new fully equipped fun bike for 1964. The all new Sting_ray that's so much fun to ride you have to ride it to believe it. Fully equipped with chrome fenders, deluxe Solo-Polo saddle, nylon whitewall tires - studded rear, middleweight front. Butterfly handlebars, extra large rear reflector. Colors: Flamboyant Lime, Red, Radiant Coppertone, Sky Blue or Violet. The fun bike with the sports car look. The bicycle with the sports car look. Highly manuverable ... short turning radius .. quick response on starts. Equipped with 20" frame, high traction studded balloon rear tire, standard middleweight front tire, butterfly handlebars, Solo-Polo saddle. 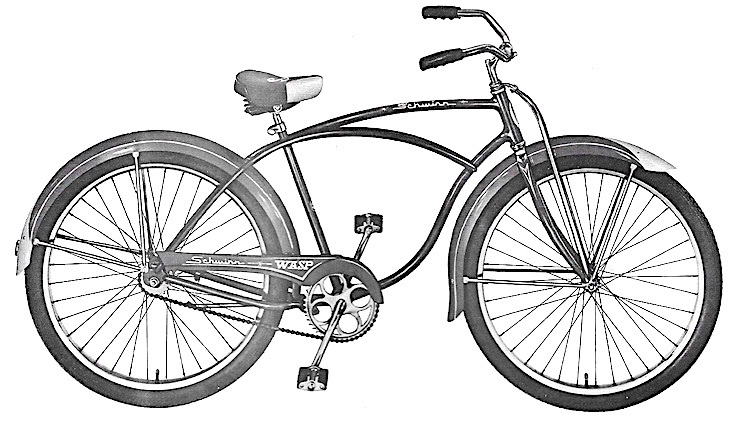 See the complete history of the Schwinn Sting-Ray. Ladies' deluxe equipped Sting-Ray model. A beautiful new Sting-Ray style bike for mother, daughter or even grandmother. 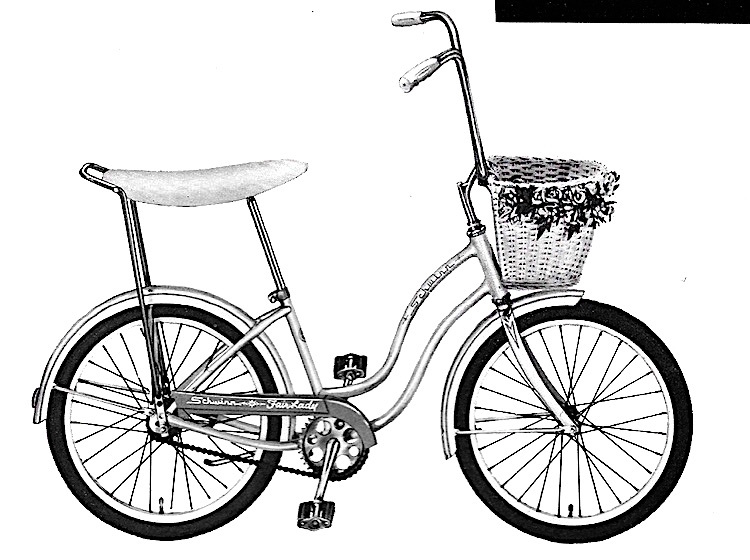 This sparkling model is designed with a 20" frame, standard middleweight tires, Solo_polo saddle, butterfly handlebars, rear reflector and attractive white, flower trimmed basket for purse or packages. Radiant Blue, Violet or White with Rose. 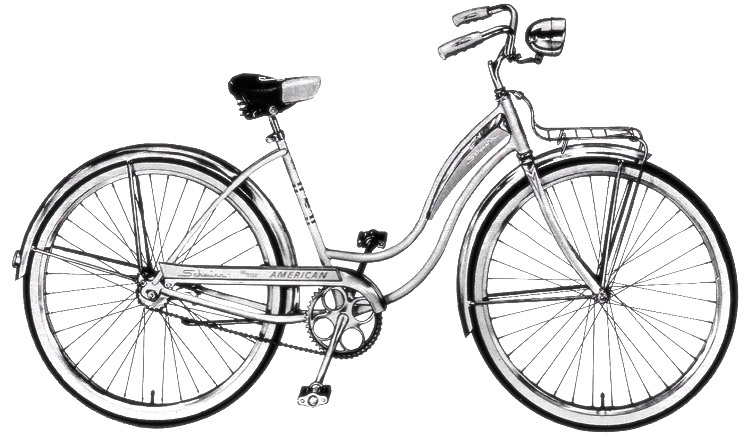 See the complete history of the Schwinn Fair Lady.